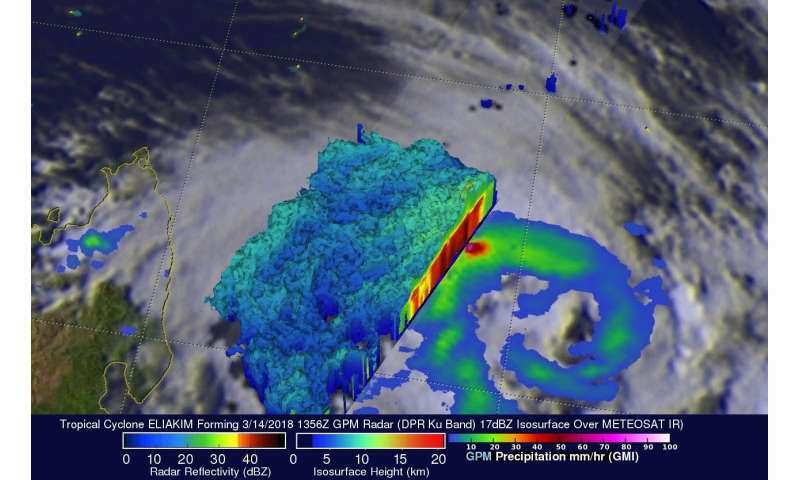 As Tropical Cyclone Eliakim was strengthening on its way to landfall in Madagascar the Global Precipitation Measurement mission, or GPM, core satellite found very heavy rainfall occurring in the tropical storm. Tropical Cyclone Eliakim showed improved organization when the GPM Core Observatory satellite flew above on March 14, 2018, at 11:56 a.m. EDT (1356 UTC). GPM's Dual Frequency Precipitation Radar (DPR) data revealed that intense convective storms were occurring in the northwest quadrant of the forming tropical cyclone. A 3-D probing by GPM's radar revealed the potency of storms in that part of the forming tropical cyclone. GPM's DPR found that a few storms in that area were dropping rain at a rate of over 205 mm (8.1 inches) per hour. A simulated 3-D view of Eliakim was created at NASA's Goddard Space Flight Center in Greenbelt, Maryland, using GPM radar data (DPR ku Band). The 3-D image showed the intensity and heights of powerful convective storms on the northwestern side of the developing tropical cyclone. Storm top heights above 13 km (8.1 miles) were frequently spotted in that region by GPM's radar. GPM is a joint mission between NASA and the Japan Aerospace Exploration Agency, JAXA. 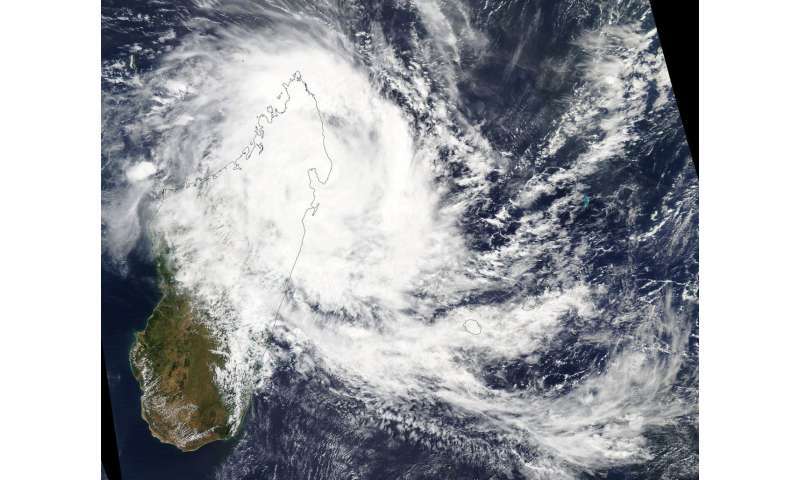 On March 16, the Joint Typhoon Warning Center noted that animated multi-spectral imagery showed the strong thunderstorm bands have collapsed and unraveled after the system made landfall over the Masoala Peninsula on the east coast of northern Madagascar. NASA's Aqua satellite provided a visible light image of Eliakim after it made landfall. The Moderate Resolution Imaging Spectroradiometer or MODIS instrument aboard Aqua revealed that Eliakim's clouds blanketed the northern half of the island nation. The image showed bands of thunderstorms wrapping around the low-level center and extending east of the center. By 11 a.m. EDT (1500 UTC) on March 16, Eliakim was located about 263 nautical miles northeast of Antananarivo, Madagascar. The center of circulation was near 15.9 degrees south latitude and 49.7 degrees east longitude. Maximum sustained winds were near 52 mph (45 knots/83 kph). Eliakim was moving to the west at 5.7 mph (5 knots/9.2 kph). Madagascar Meteorological Services posted a red cyclone alert for the northeastern part of Madagascar that includes areas of Sava, Bealalana, Befandriana Nord, Mandritsara, Analanjirofo, Atsinanana and Alaotra. Yellow and green warnings extend to the west. Heavy rainfall and strong winds are forecast, and storm surges are expected along coastal areas. Tropical Cyclone Eliakim is expected to move back over the Indian Ocean and be absorbed into the baroclinic zone. That's a region in which a temperature gradient exists on a constant pressure surface. Eliakim is expected to regain strength for a short time before weakening because wind shear is characteristic of a baroclinic zone.